Whether it’s a full-blown stag party or a weekend getaway with the guys, we’ve got you covered for the best bachelor ski destinations of the season. Interested in a mountain town Vegas? Head to Heavenly. Stoked on adventure in the backcountry? Drop into Whistler Blackcomb. Looking for a quick way to get out of NYC? Consider a road trip up to Killington. While the destinations are all different, they each have one thing in common: they meet our criteria for an unforgettable bachelor getaway. Heavenly is a go-to destination for skiers and non-skiers alike, and exceedingly popular for bachelor and bachelorette parties. The resort itself stretches across the California/Nevada border, making for a laid-back village on one side, and a booming casino resort town on the other. The casinos, nightclubs, shopping and parties offer a miniature Las Vegas scene; couple that with world-class skiing at Heavenly Resort and you’ve got the perfect mix for a bachelor getaway. This place caters to twenty- and thirty-something party-goers looking to step into a fantasy world for a weekend (and pay a pretty penny to do it): we recommend living it up. Be sure to get out on the slopes between gourmet meals and world-class dance parties. Top Pick For: nightclubs, gambling, Vegas-style debauchery. Stay…at the newly renovated Montbleu – a 21+ only resort, casino and spa 2 blocks from the ski lifts. Book one of the Tahoe suites for the best pregame digs. Ski…load the Sky Express for access to the best glades on the hill; Ski Ways Glades and the Pinnacles make for fun tree runs on a powder day. Fine Dining…Ciera is Tahoe’s only four-diamond restaurant, and boasts a menu of delectable steaks and seafood; order the signature 24oz Cowboy Rib-eye and pair with one of many fine red wines. Cheap Eats…Fuel up at the California Burger Company; the restaurant features stacked burgers, strong whiskey, and live music in a casual tavern setting. Après…Heavenly kicks après up a notch at the Tamarack Lodge; half price drinks, live DJs, dancers and a Euro-club vibe make for the best on-hill party in Tahoe. Nightlife…Book a VIP table at Opal; this super sensual lounge features dancing, DJs, bottle service and body painting. Off The Slopes…Try your luck at the Blackjack table inside Montbleu’s casino; if you promised your honey you wouldn’t gamble, head to The Zone Sportsbar and catch up on the sports games. The darling of the Wild West, Jackson Hole Mountain Resort made it big in the ski industry for its incomporabley challenging in-bounds terrain. Today, it stands as a mecca for big mountain skiers and big time spenders alike: the resort attracts celebrities, jet-setters, and foreigners seeking a glimpse into the romance of the Old West. But Jackson Hole is far from dated: while the place maintains its early 1900s charm, the restaurants, hotels, and resort infrastructure are world class. You'll find white linen lunches, luxury digs, and a foodie scene that rivals San Francisco. There's also a good chance you'll spot a moose moseying along the Snake River on your way to the resort in the morning. When it comes to wildlife and scenery, Jackson Hole wins again and again. When it comes to the bachelor ski getaway, Jackson Hole also wins in its culturally rich spirit, fierce terrain, and laid-back luxury. Top Pick For: Wild West saloons, challenging slopes, stunning scenery. Stay…at the Amangani; this ultra exclusive resort offers elegant rooms and suites with the best Teton Range views in the area – it’s the hot spot for the rich and famous. Ski…Take at least one lap down the Hobacks; this 4,000 foot vertical tram lap is a local favourite, and great for bragging rights when you get back home. Fine Dining…Local is a hip modern steakhouse on the town square; chefs source the best fish and game from local farms, and the space has some private nooks for large groups. Cheap Eats…At Teton Village, stop by The Handlebar inside the Four Seasons for a burger and beer with mountain views. Après…Don’t miss the debauchery at the Mangy Moose – this Jackson Hole mainstay pulls in rockin’ live music acts that play from last chair past dark. Nightlife…Cut some serious rug to county rock bands at the Million Dollar Cowboy Bar; you’ll rub shoulders with your fair share of tourists, but it’s also an old time local watering hole where you can quite literally “saddle up” to the bar. Off The Slopes…Get your western glam on at the specialty goods and clothing stores for men; Wool and Whiskey in Teton Village offers whiskey tastings as you browse, and Mountain Dandy in downtown Jackson sports mountain chic goods and clothing. If you were to drop into one of Whistler's nightclubs at 1am on a weekend night, you'd likely feel you could be anywhere in the world. Between the world-class DJs, sweaty dance floors, and VIP service, this town's nightlife is as solid as anywhere in the French Alps. Whistler Blackcomb is known for its nightlife amongst vacationers looking to be up all night; it's also famous for boasting the most skiable acreage of any resort in North America. At 8,171 ac between the adjoining Whistler and Blackcomb mountains, this resort has everything a skier could want: including access to pristine backcountry via professional guides. For bachelor getaways, the resort caters to outdoor adventurers with on- and off-slopes activities like snowmobiling, ziplining, and ice climbing. And the, of course, is the bumpin' party scene. Dare to burn that candle at both ends? Be sure to hydrate! Top Pick For: big mountain skiing, luxury value, nightlife. Stay…Five-star Pan Pacific Whistler Mountainside offers luxury digs and multi-bedroom suites for ultimate comfort and pre-party lounging; when you’re not on the slopes or at the bars, hit the outdoor heated salt water pool. Ski…Book a backcountry ski tour with a professional guide; Whistler Blackcomb boasts some of the best big mountain skiing in North America – and you can experience it sans lift lines and crowded slopes. Fine Dining…Opt for swanky and sophisticated at Araxi; one of Whistler’s farm-to-table pioneers, the restaurant and oyster bar serves up delectable Pacific Northwest cuisine. Cheap Eats…Burritos as big as your face are a must from Dups Burritos; they’re located just off Main Street in Whistler village. Après…Roll into Merlin’s for craft draughts, shotski rounds, and live music; we’re betting you’ll also have the opportunity to dance on the bar in your ski boots – as you wish. Nightlife…Twenty- and thirty-somethings go to Garfinkel’s for world-class DJs, and a vibrant dance scene; each night boasts a different theme; Fridays and Saturdays get packed fast – get on the guest list for VIP-line access. Off The Slopes…Whistler is the winter outdoor adventure mecca of BC – get your adrenaline going with a zipline tour above the mountains or ice climbing with a professional guide. Breckenridge offers the best of both worlds as a Colorado bachelor getaway: world-class terrain for serious skiers and riders, and a downtown party scene to rival any resort in the country. While it's possible to get really rowdy at Breck, we like it more as a mountain town for the mature party-goer: those looking to have a great time on and off the slopes. Packed with craft breweries, modern American restaurants, and its own distillery, the old Victorian downtown offers everything your crew could want for a taste of authentic Colorado. On the hill, you'll find nearly 3,000 skiable acres serviced by 34 lifts, and some of the best hike-to terrain in Colorado. If you're counting on a powder day during your getaway, bet on Breck: its location amongst massive Rocky Mountain peaks ensures an average annual snowfall of 25 ft.
Top Pick For: casual guys weekend, craft beers and spirits, hearty steaks. Stay…The condos at Main Street Junction feature private bathrooms for each bedroom, gas fireplaces, and high ceilings; walk across the street to load the Quicksilver Char at Peak 9, or take the complementary shuttle anywhere in Breckenridge. Ski…Advanced skiers should head straight to Peak 10, which has good glades below tree line; Peak 9 slopes are best for intermediates and advanced skiers who want to access hike-to terrain. Fine Dining…Book at the Briar Rose for steaks and chops; opt for authentic Colorado cuisine with elk medallions or buffalo short ribs, enjoy family style sides with your whole crew. Cheap Eats…The Breckenridge Brewery has the best pub fare in town (paired with delicious beers, of course); drop in for $2 USD (£2 GBP) off draughts at happy hour (daily 3-6pm) and stay for heaping plates of nachos and wings. Après…Upwards of 150 skiers and riders kick back in the no-nonsense plastic chairs outside T-Bar, Breck’s slopeside watering hole; go for drink specials and hearty apps, then ride the BreckConnect Gondola downtown to continue the party. Nightlife…Dance ‘til the wee hours at Cecilia’s Martini Bar; start in the first room with a single malt scotch, then make your way to the back of the club, which boasts the biggest dance floor in Breckenridge. Off The Slopes…Tour Breckenridge Distillery, which started as a risky pipe dream for founder Bryan Nolt and now crafts award winning spirits distilled with the purest Rocky Mountain water; a cocktail bar and small restaurant were added in 2016. 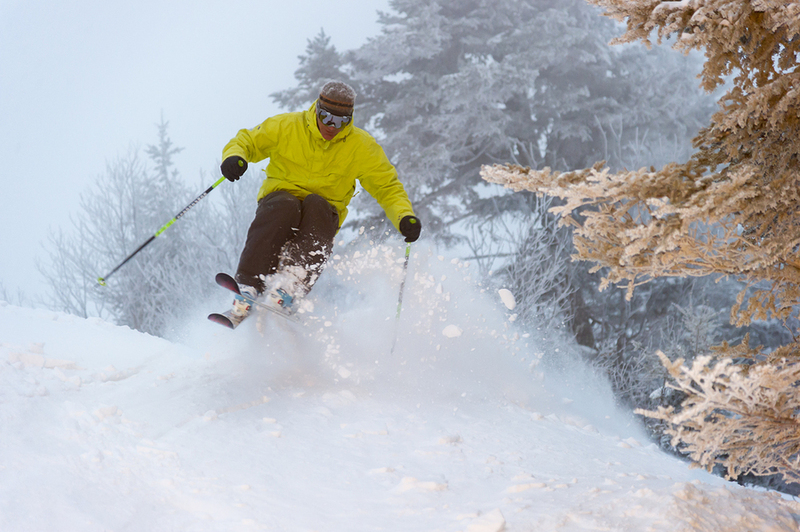 Killington calls itself "The Beast of The East," and for good reason. This massive (by Vermont standards) resort boasts just over 1,500 ac skiable terrain, and 3,050 ft vertical. We could call it The Beast for other reasons, too -- like its proclivity for attracting 20- and 30-something party-goers looking to ski, ride, and let loose at one of Killington's infamous nightlife spots. As far as New England destination ski resorts go, this is perhaps the most popular for bachelor (and bachelorette!) parties, so hotels, restaurants, and bars are ready to cater to such parties. You won't find as much of the luxury vibe here as in the Rockies, but you'll find plenty of soul. Top Pick For: local New Englander getaway, nightlife, varied terrain. Stay…Go big with a penthouse at the Killington Grand Resort Hotel; you’ll score a private sauna, fireplace, huge living space and mountain views at Killington’s only full-service hotel. Ski…Killington Peak has the best glades, while neighbouring Snowdon and Ramshead are best for intermediates; stay away from the Snowshed base area if you can – it crowds easily with families and beginners. Fine Dining…The Foundry is for the classy at heart (or the classy-for-an-evening crew); the kitchen specialises in fine steaks and seafood – sit in the tavern area for the dining room menu with more casual ambiance. Cheap Eats…We couldn’t possibly describe Jax and its quirkiness to you – you’ll have to go for yourself: $10 USD (£8 GBP) per plate pub fare, TVs to watch the game, live music 7 nights a week, and a laundromat downstairs for grimy ski bums in need of fresh socks – it’s a Killington classic. Après…Get your drink on in the German style Roaring Brook Umbrella Bar at the base of K-1; goofy German music makes for a festive vibe, and watching wobbly skiers make their way down the Cascade Runout at day’s end makes for bonus entertainment. Nightlife…The Pickle Barrel boasts 4 bars, 3 floors, and 2 stages specially crafted for debaucherous nights; they specialise in hosting bachelor/bachelorette parties – if you’re seeking the VIP treatment, contact them ahead of time. Off The Slopes…Opt for a backcountry snowmobile tour; Snowmobile Vermont offers 2-hour tours through the Calvin Coolidge State Forest, and flexibility to go at your own pace (so you can book it down the straightaways and meet your friends at the bottom).